I went to have drinks with a friend in Roppongi. I went to an upscale Karaoke place in Nishiazabu called Voice. Its not your run of the mill vynil bench seat, smelly Karaoke box. This place actually has a nice sound system, with a giant flat screen TV, and the furnitue looks like some stuff out of Crate-and-Barrel or Pottery Barn. Its nice and quiet all around too. No sound leakage from other rooms. I went to Bluenote Tokyo again to go see Peabo Bryson this time. Peabo is famous for all of the Disney movie theme songs like “A whole new world” from the movie Aladdin. Hearing and seeing him live was great. He’s got a really deep and rich voice, plus he is great with the crowd. I can’t believe he actually shook everyone’s hand in the audience. What a crowd pleaser. Went to a Chanko-nabe place in Aoyama called Chez Taikai. I think its run by a sumo wrestler or something. His hand and foot prints were displayed at the entrance. The chanko-nabe was grubbin. Perfect for this winter season. After dinner I headed out to Ginza to meet up with some people in the industry. Market has been pretty bad these days so all of us needed some cheering up. So, what do we do, go have a couple of drinks with some hostess bar chicks in Ginza. I went to a restaurant called Kurosawa today in the Tsukiji area. 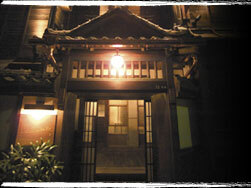 The restaurant is themed after the legendary directory Akira Kurosawa. Serving delicacies that were favorites of the director such as Kagoshima beef and hand made Soba noodles. 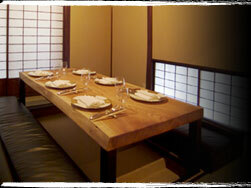 The interior is designed in a manner to make you feel as if you were invited to Kurosawa’s home. You are currently browsing the THE FFUJE blog archives for January, 2007.